LEVRETA board member Emeritus Professor Aart Kooijman handing out the award to Sandra Hanekamp. Sandra Hanekamp has won the LEVRETA Award for the “most inspiring, effective and professional scientific oral presentation” at Vision 2017. She was awarded this prize for her presentation “Structural brain MRI studies in glaucoma: are they clinically relevant?”. 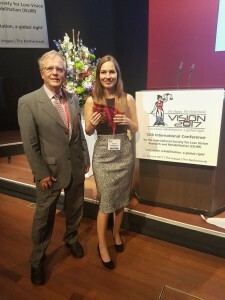 Vision 2017 was the 12th international conference on Low Vision organized by the International Society for Low Vision Research and Rehabilitation, and held from June 25th-29th in The Hague, the Netherlands. The LEVRETA Award is awarded by the Leonardo European Vision Rehabilitation Education and Training Association.